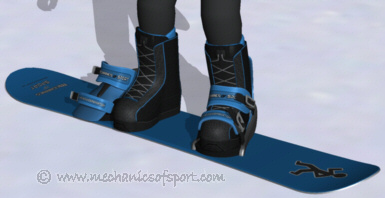 Stomp pads are gripy pads that are stuck on the top of a snowboard just in front of the back binding. 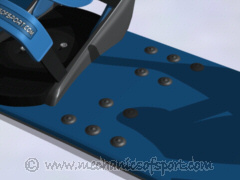 There are many types of them from rubber pads, to spikey blocks, and individually placed spikes (the type shown here). They are a very handy invention that helps your back foot grip the board better when you only have your front foot in the bindings. Snowboarding has many situations where you only have your front foot in the bindings with your back foot resting on the top of the board, like getting on and off of chair lifts, riding drag lifts, or when skating the board across flat areas. It is good to be as comfortable and controlled in these situations as possible, which is what the stomp pad is for. Without a stomp pad the back foot can slide across the board easily, loosing your control and balance. The stomp pad simply gives your foot more grip so you can keep your balance and push on the edges better. Stomp pads are also pretty handy for knocking the snow off of the bottom of you snowboard boots before putting them into the bindings. On to the Protective Clothing section. Please quickly fill in what you thought of the page here, commenting on anything you liked or think could be improved on the page. Please note this form is to submit feedback for this page only, if you would like to comment on the site in general please go to the Site Feedback Form here. How much detail does the page go into? How easily did you understand the explanation? How much did you learn about skiing that you didn't already know? How helpful did you find the graphics? What extended features would you most like to see on this page? Mechanics of Sport takes feedback very seriously to try and improve the website. If you would like to know a bit more about how the feedback is used please go to the Feedback Information Page here.